In the United States, lung cancer remains the leading cause of cancer mortality in both men and women, with more than 50% of patients presenting with locally advanced, inoperable, or metastatic disease. Approximately 33% of patients with nonâ€“small-cell lung cancer (NSCLC) present with advanced-stage disease while most patients with early stage NSCLC will eventually develop metastatic lung cancer. Despite the numerous therapeutic options available, only 15% of patients with lung cancer survive beyond 5 years from diagnosis. 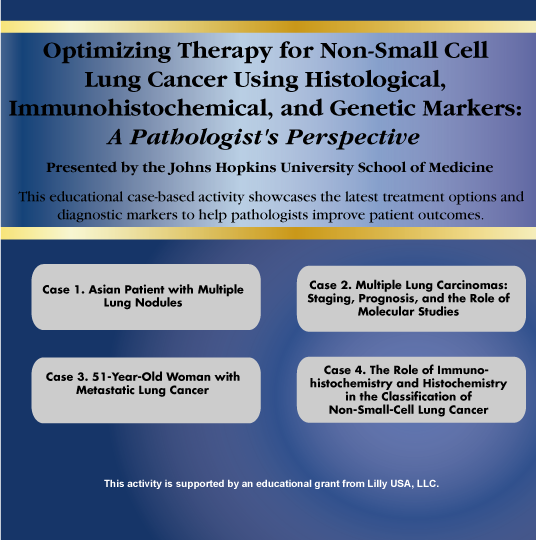 Recent advances in genetic and histological markers, coupled with emerging targeted agents for NSCLC, have the potential to improve patient outcomes. There also has been much progress in the treatment of advanced NSCLC in the last several years as clinical trials have demonstrated improved outcomes with novel therapeutic agents directed against a wide array of molecular targets. Pathologists function in several broad areas, including as diagnosticians and investigators, and are uniquely positioned to assist oncologists with the development of a comprehensive treatment plan. The following educational activity consists of 4 interactive modules. Each activity will present different case scenarios, using the latest treatment options and diagnostic markers to help pathologists improve patient outcomes.